The Turkish Center is ready,after almost one full year of struggle, hard work and sweat. It is just the combination of financial and manpower support of Turkish friends who have been dreaming of this day. 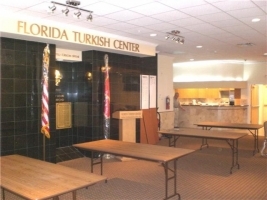 Florida Turkish American Association has established in 1964, and formally registered as non-profit organization in 1987. From that day, It was the biggest dream of all Turkish decent American citizens, and we are proud of bring this dream into life. From now on, this space will be acting as binding mortar amongst us. The latest photo of the Ataturk Corner. The plagues "National Anthem" and "Speech to Turkish Youth"
The tables, chairs are placed, over the new carpet. The first meeting was actualized. 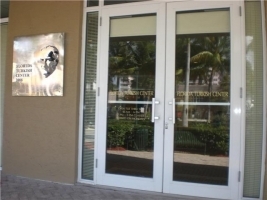 Interior and exterior signs "FLORIDA TURKISH CENTER" and "FLORIDA TURK EVI" are installed. Kitchen Contertop is installed. Under spotlight the sparkling granite is now shining. As of today, Nov. 03, 2009, FPL connected the power. Chrome plated stainless steel sign was manufactered. The bathroom equipments are installed. All are American Standard, and sensor activated faucets are being used for hygenic reasons.